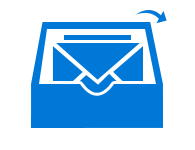 The Google Apps mailbox exporter software tends to be boon for the users who wish to switch from Google Cloud (Google Apps) to IBM Cloud / SmartCloud application without losing existing mailbox. 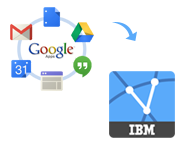 The users can transfer large number of emails from GApps to IBM email. 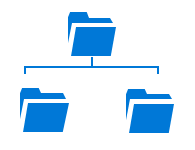 To help out the users in keeping the folder hierarchy intact, the Google Apps migration for IBM Verse tool assures to move the emails in same folder order. 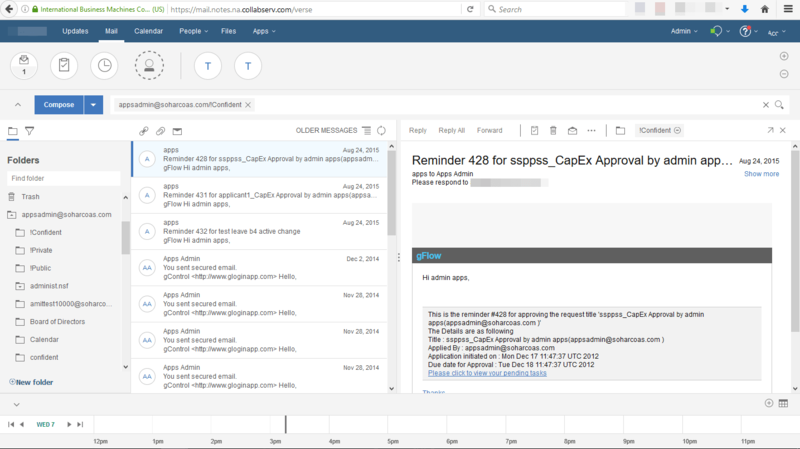 All the emails are uploaded to IBM Cloud in the same folders i.e., all inbox emails get exported under Verse inbox folder, Google sent box under Verse sent box etc. With the help of G Suite to IBM Mail exporter, users can easily upload/ transfer any sized Google mailbox to Verse Mail. This migrator application does not pose any size limitation on the data. Thus, even a large sized mailbox can be moved within few minutes and that too, without any data loss. Using date filter option, the users can choose to export the selected emails. The users can save/ move emails for a particular time interval by applying these filters. 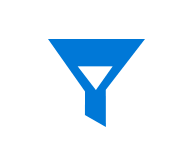 The Google Apps to IBM Mail/ Verse Mail exporter itself sorts the selected data from Google cloud and moves the filtered data items into IBM Verse. IMAP configuration should be enable for G Suite. Allow access to less secure apps in G Suite. 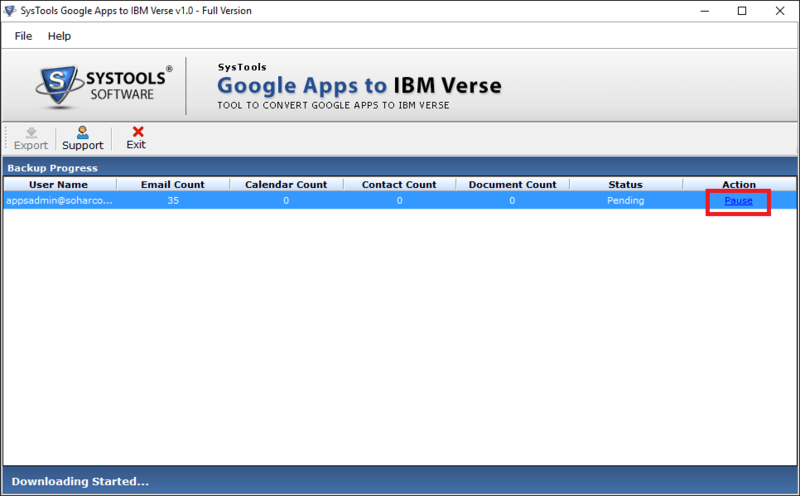 IMAP configuration should be enable for IBM Verse. 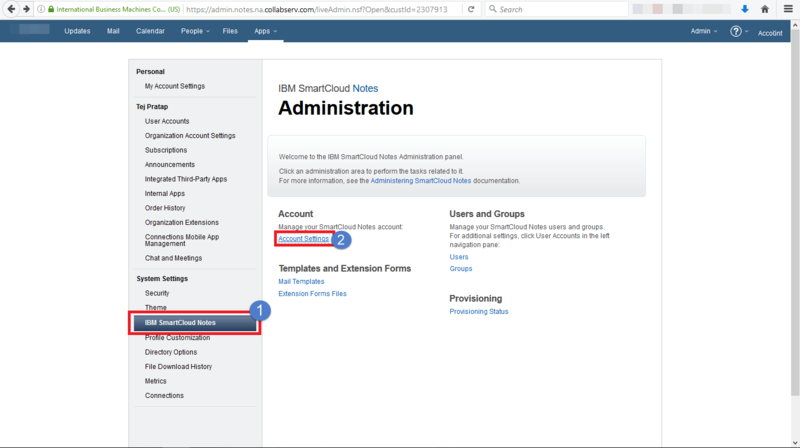 (ii) Click on IBM SmartCloud Notes option in the System Settings tab, then choose Account Settings option. 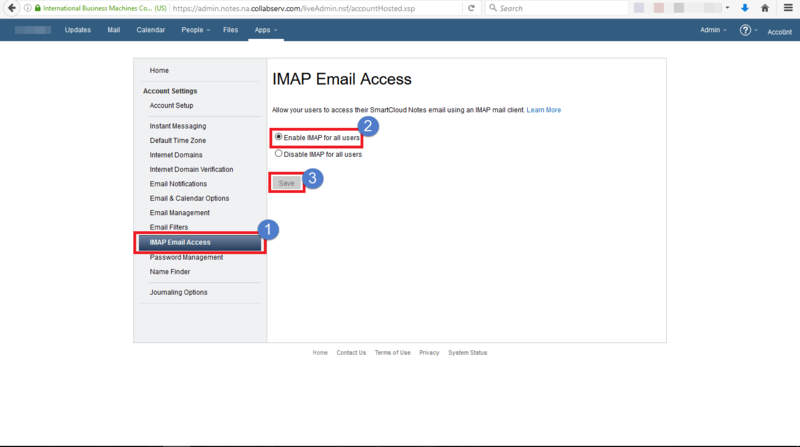 (iii) Click on IMAP Email Access, choose Enable IMAP for All Users. Click on Save which is at the bottom of the page. 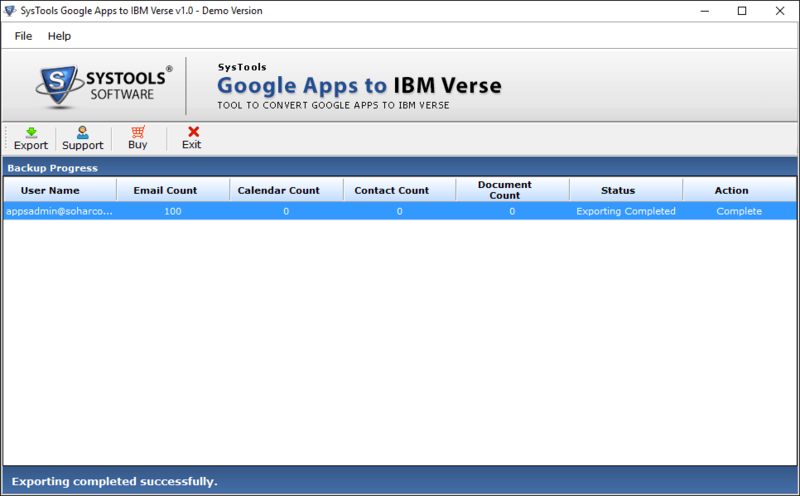 Step 2: Launch & Download SysTools G Suite to IBM Verse Migrator. Click on Export. Step 3: Select "Single User" option if you want to migrate single account. Choose "Domain Users" option if you want to transfer multiple user accounts of a domain. 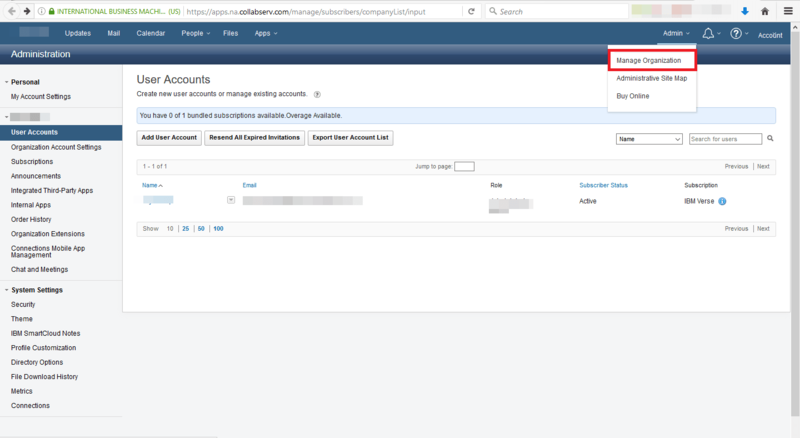 Step 4: Provide login credentials and click on "Register" After that you will receive a screen to that will show the "List of Users to Download". (i) Click on Register after entering correct credentials. (ii) Click on Next when you receive List of Users Screen. 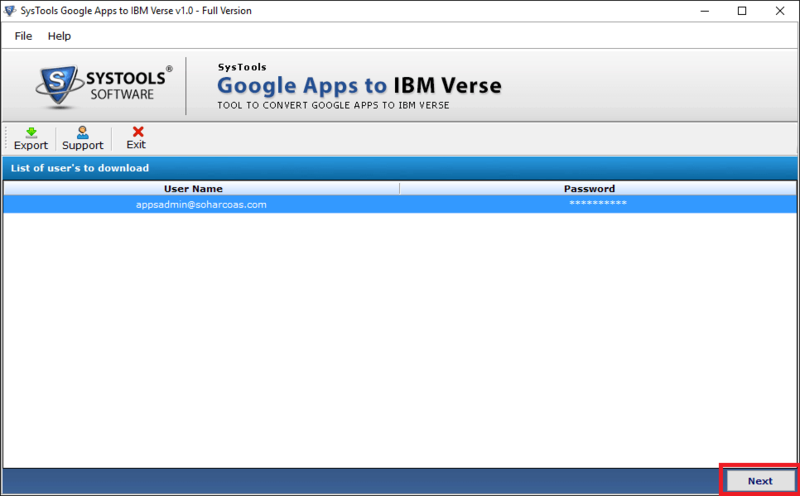 Step 5: Now you will receive a screen where you have to enter your IBM Verse account's credentials. Once you enter the correct ID and password, the tool which authenticate your account. Step 6: After the authentication is successful, select the filters that you want to apply and then click on Start. (i) Add Time Interval: This filter allows the users to select date range of mailbox data that is to be transferred. 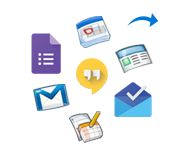 (ii) Include GApps Folders: This filter allows the users to migrate selective folders of G Suite mailbox to Verse. The folder names should be separated by comma. Step 7: The Migration begins. After completion, you will receive a "Exporting Completed Successfully" message. (i) You can view the status of export along with the emails count. The tool also provides option to Pause / Resume the process. (ii) Message after successful completion of the transfer process. Click on Ok. Step 8: You will receive a detailed report after completion of the migration. 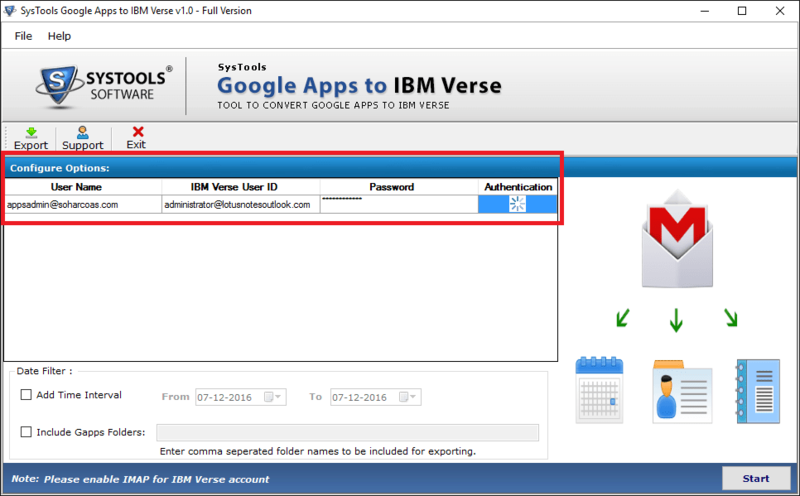 Step 9: You can verify the export process id successful by logging into your IBM Verse account. 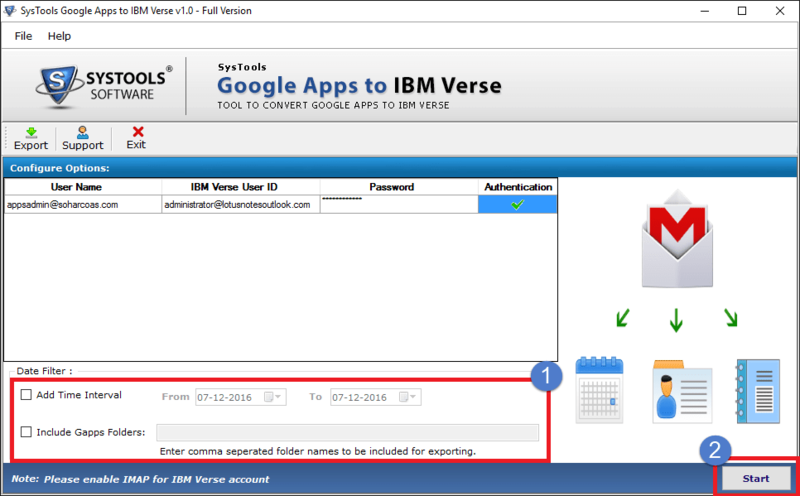 How can I access my Google mails on IBM Verse for android? 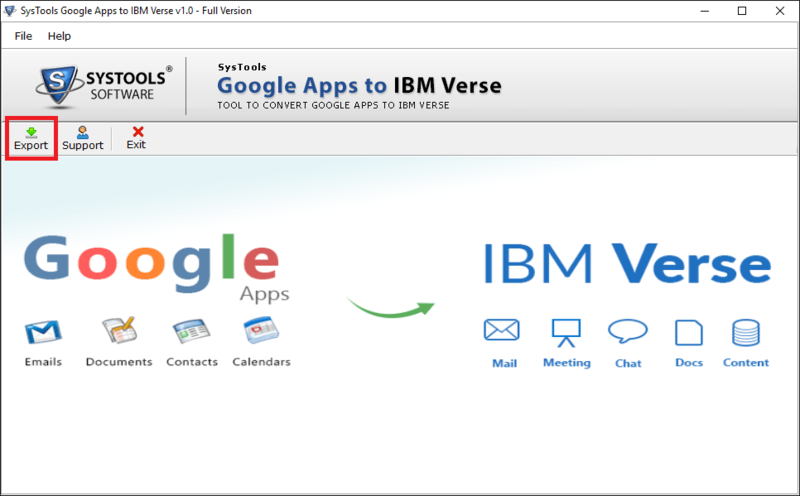 Using G Suite to IBM Verse migrator software, you can easily upload emails from Google Mail to Verse. Once, the emails are moved to IBM Cloud, you can access the emails from mobile or desktop. Is it possible to transfer Google Accounts for 1000 employees within a go? Yes, you can choose Domain User option to carry out migration of email accounts of complete domain simultaneously. 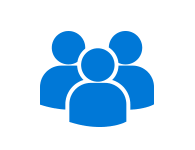 The authentication details for domain login needs to be provided so that software can access all mailboxes from Google cloud. Does this software allow me to upload my contacts from Google Apps for Work to Verse? No, G Suite to IBM Verse migration software exports only emails. It does not transfer the other mailbox data. Is it possible to extract selective calendar from Google Apps? No, it is not possible to save G Suite calendars to IBM Mail.